We collect information from our merchants in line with our internal policies and procedures. Higher processing volumes require us to collect additional information to verify the identity and nature of the businesses we’re serving. If you want to raise your approved processing volume limit, log in to your BitPay dashboard to apply for a higher tier. When you select "Apply," you will be redirected to a page where you can securely upload the information and documents we require. Below are the requirements for increasing your approved volume limit. 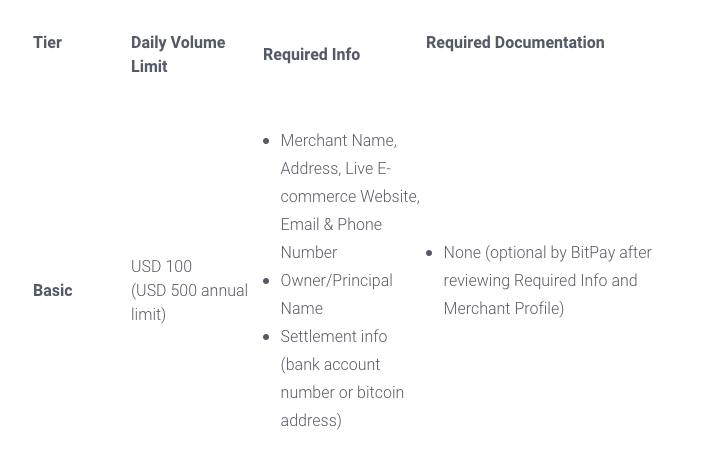 Note: for certain industries BitPay may ask for additional documentation. If you are a publicly listed company, please contact us at compliance@bitpay.com. Watch our FAQ video "How to Upgrade Your BitPay Approved Processing Volume Tier"
Merchant approved sales volumes are on a rolling 24 hour time frame. This means that when an invoice is fully paid, the paid amount is reduced from your approved sales volume for 24 hours. Let us say you have an approved sales volume of $100 per day and your client creates and fully pays an invoice for $25 on January 1, 2014 at 12:00 UTC. Your approved sales volume will be reduced by $25 until January 2, 2014 at 12:00 UTC. On January 2, 2014 at 12:01 UTC, your approved sales volume will be reverted back to $100 until another invoice has been fully paid.